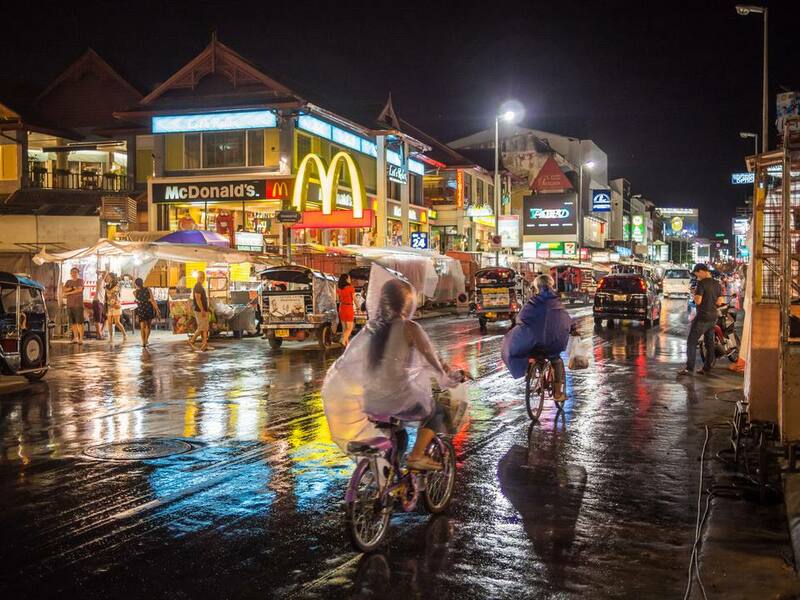 From the months of June to October, most of Thailand's top tourist spots experience the brunt of the monsoon season, with overcast skies punctuated by heavy rainfall. Thailand's rainy season isn't all that bad for tourists: with less competition for tourist services and lower rates all around, travel in Thailand doubles in ease at half the cost. But setting up a rainy-season itinerary requires some degree of lateral thinking. Beaches and islands are mostly out of the question (blame the rainy-season choppy seas for that), so you'll have to exercise your imagination. Luckily, there's still plenty of fun to go around despite the weather! The Thai capital Bangkok is a shopper's dream, with both high-end shopping malls and sprawling markets all connected by the BTS and MRT light rail systems. Bangkok's markets and malls offer something for everyone. Fashion lovers congregate at Pratunam, Thailand's biggest clothing retail district; hipsters converge on Talat Rot Fai, an open-air night market with a surfeit of vintage items; and luxury seekers will find what they need at the ever-evolving Sukhumvit district and the malls clustered around the Siam BTS station (MBK Center Mall and Siam Center among them). For sheer scale, no Bangkok shopping experience can equal that of Chatuchak Weekend Market, a sprawling bazaar hawking everything from furniture to fashion to books to food. With 15,000 stalls to see, hitting Chatuchak is less a casual trip, more of an endurance event! What's better than being a spectator to Thai culture? Being a student! Not only do Thais welcome tourists to see their arts first-hand, they also offer the opportunity to learn these arts first-hand. Classes on Thai arts vary in intensity from single-session classes to months-long one-on-one instruction. In Chiang Mai, travelers can enroll in cooking classes that introduce budding chefs to Northern Thai cooking ingredients and techniques. Some classes are even vegan-friendly! Learn in an organic farm at the Thai Farm Cooking School, or take on Thai home cooking at A Lot of Thai. The capital Bangkok has an even greater selection of classes for tourists, catering to interests as diverse as traditional Thai dance and muay Thai kickboxing. Thailand's calendar of festivals extends over to the rainy season, too: the rains hardly dampen the festive fun! The Phi Ta Kon Festival in Loei, northeast Thailand, coincides with the Buddhist holiday of Bun Luang. The festival resembles a Thai Halloween, with locals dressing up as ghosts and spirits, donning intricately-decorated masks for the occasion, complete with bells and phallus-shaped amulets. The Bun Bangfai Festival in Yasothon, eastern Thailand, marks the end of the dry season by firing giant rockets into the air. The fireworks are intended to appease Phaya Thaen, the god of rain, who will send down plenty of rain in return. The festivities also include drunken singing in the streets, and hit a climax on the weekend parade day: floats bearing large rockets roll down the main street, flanked by locals in their finery. The fruit season and the rainy season go hand in hand; visit Bangkok's fruit markets and fruit buffets to enjoy Thailand's rich pickings when the downpours come. Southeast Asian fruits like the rambutan, mangosteen, dragon fruit and the famously stinky durian grow profusely in Thailand, with much of the harvest converging on Bangkok. When in the capital, go to fruit markets like Or Tor Kor Market to check out its goods: ripe fruits in massive quantities, with sellers willing to let you taste your way through the whole spread. For a more upscale fruit-eating experience, the Baiyoke Sky Hotel offers a fruit buffet for foodies: sure, it's more pricey than a market visit, but the fees pay for the air-conditioning and gorgeous skyscraper view as you gingerly try durian for the first time! The swelling rivers that come with heavy rains create the perfect conditions for whitewater rafting. The northern Thai city of Phitsanulok obliges adrenaline junkies with the Khek River Rafting Festival that runs the duration of the rainy season, from July 1 to October 31. A five-mile stretch of the Khek River has been set aside for rafters' enjoyment, including eighteen rapids that quickly escalate from calm waters to a bone-shaking level IV and V ride. The fast-moving currents allow little room for error: the terrifying ride reaches its climax at the positively dangerous Kaeng Yao Rapids, before settling to a Level II stroll right before the course's end at Kaeng Thap Khun Tai. Finish your Phitsanulok experience by sipping on a hot cup of the local Arabica coffee, during the Kaeng Song Coffee Sipping Festival that coincides with the rafting season. The famous Thai contact sport has no shortage of venues in Bangkok: both of the capital's biggest muay Thai arenas, Lumpinee Stadium and Rajadamnern Stadium, host matches almost every day. You can also schedule your trip to coincide with the Queen's Cup muay Thai tournament in August, which takes place in Sanam Luang Park near the Khao San backpacker district; unlike the other muay Thai events mentioned earlier, the Queen's Cup allows foreign fighters to compete. For a showier muay Thai match that's more a performance than a competition, the riverside Asiatique market offers a regular “Muay Thai Live” show that leads into “Warriors Rising” matches, a double bill that perfectly complements the shopping and dining to be had in the area's many stalls. Bangkok's royal palaces and museums give you more than a few days' worth of indoor entertainment as the rains rage outside. Worthy museums and attractions in Bangkok include the Grand Palace and the attached Emerald Buddha Temple; the riverside Wat Pho; and even strangely creepy curiosities like the Siriraj Medical Museum, home to formaldehyde-preserved fetuses and a mummified serial killer. Several Buddhist temples offer an interesting look into local religious practices, and are free to visit, to boot. These include the Wat Indraviharn (Intharawihan) in Dusit, renowned for its 100-foot-high standing Buddha; Wat Mangkon Kamalawat in Chinatown, Thailand's largest Chinese-style Buddhist temple; and Wat Pathum Wanaran in central Bangkok, easily accessible as a side-trip from Siam Square.